The best soft skinned/collapsable flasks available ! OVERVIEW: New type of non-metallic flask that is leakproof, concealable, and takes up very little space.Very handy item to have. No metal, undetectable, relatively shapeless (no dead give away flask outline on person or clothes). 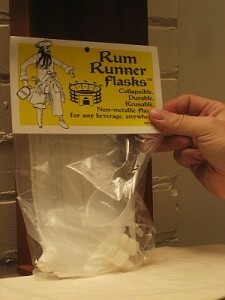 These are made in the U.S.A. out of a food grade plastic and they have welded seams of incredible durability.They test these things by putting them in outer space levels of vacuum to check for leaks, so no worries about airplanes or just wandering about somewhere and suddenly reeking of alcohol and looking worse. Appearance: Decently made, seams and molding look damn near bombproof, looks like a small rectangular camelback water bag but better quality, with spout and cap at one corner and pleated bellows bottom (allows you to set flask down on end). Most come with a handy filling funnel. First Impression: Tough, durable, folds or rolls flat, lightweight, unbreakable easy to fill, leakproof. Testing: Leakproof (unlike a lot of flasks) after putting upside down for hours. Worked everywhere with a minimum of problems. Did not affect the taste of my test whisky. One of the more unique features is you can freeze liquid in it (and by removing the air and laying it on its side you can adjust the thickness of the ice), then either leave it as a floating block or break it up for ice cubes – try that with another flask! Final Thoughts: They worked wonderfully – I HIGHLY recommend it for the transport of all distilled beverages (or any other non-carbonated liquid) where convenience or discretion require a flask. Damn cheap for the quality you are getting- also, if by ill chance it gets confiscated you are not losing a lot of money either. Cheap as dirt, durable as hell, low profile. Best flask there is for holding just about any liquid. Cheap enough you can buy several in different sizes for the price of one other type of flask that may break, leak or possibly poison you. The one-stop shopping website for all sorts of flasks, spray bottles, squeeze bottles, containers, etc., all made in America, and to the highest standards.